When you first start singing, it is natural to want to be able to sing with more power and to be able to hit notes with more gusto. The problem that most singers face however, is that it takes time for your vocal muscles to strengthen and catch up with the amount of oomph you want your voice to produce. You may also be just like me and find that your voice is very smooth or pretty and just doesn’t have much grunty edge to it. So what do you do? Stick to singing lullabies that don’t require any kick? NO WAY! 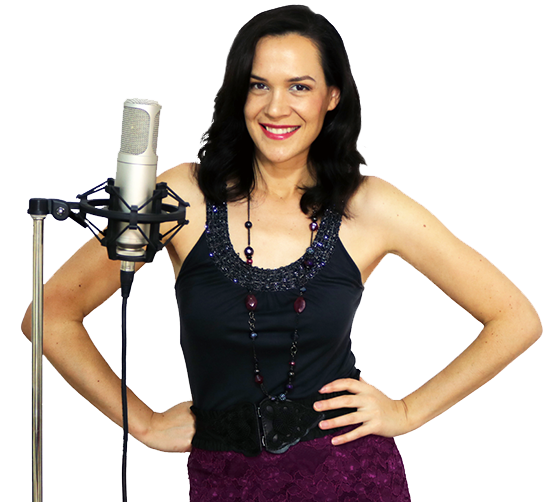 In this video I’ll share 5 super singing HACKS that you can use to make your voice sound powerful and gutsy, even if its not, so that you can still sing the songs you want to while you’re waiting for your voice to catch up. Always remember to articulate more when you sing. Mumbling in singing is a huge problem so its a good idea to over-articulate in your practice anyway. What kind of voice do you have? Does it have edge to it already or is it soft and pretty and you’ve found it hard to get any power happening? Let me know whether you’ve tried out these singing hacks for yourself and whether you found them useful in the comments below. Hack #1 – Articulate your words. Use your consonants to really emphasise sounds and give your words more of a kick. Hack #2 – Give yourself somewhere to go in the music. This means using dynamics to build the music to a high point and then bring it back down to a lower volume again. if you start off too loud the audience will expect that volume or louder and if you have nothing more to give, then your song will sound flat. Hack #3 – Let the microphone do the work for you. Its an amplification device so use it! Don’t try to strain your voice to sing louder than it is ready to because you will only damage it or sound bad. Let the mic do the heavy lifting. Hack #4 – Harden your vowels. Soft posh sounding vowels don’t have any edge to them whilst harder sounding squashy vowel sounds do. You have manipulate your words slightly to sound harder just by altering the shape of your vowel. Hack #5 – Use vocal techniques like growls. The growl is at 2:18. You are so generous with your knowledge. I have been learning to sing off and on for years and have had some “top(? )”London coaches and not one has given such fabulous current instruction as you. Thank you again for the wonderful tips. Also, wanted to thank you for the last video on ‘how to reduce strain when singing the higher notes’. It has been helping me out well. I had a question regarding that video though, which is that ‘Is this a temporary thing?’, as in when you practise with your tongue out or do the lip drills, the bad muscle memory of the tongue reduces for just a few fours after that or in the long run, it would turn out to be something that would be kind of permanent (give that nothing is permanent in the world.haha)? I have a very loud voice when I sing so I can’t sing lullabies I’m like yelling to China because I’m so powerful when I sing can you give me some tips? You can try to practice some rock songs instead of lullabies.or you can try to reduce your voice to the extreme and sing in a microphone. I think what he means is “can you help me sing SOFTER so I can sing lullabies instead of rock songs”.